Living in Southern California certainly has its perks- beaches, Hollywood, beautiful people. But it also has its dangers- earthquakes and wildfires. August is a smokey and ashy month around here, but while it always phases me to some extent, I just hadn't really acknowledged it as a personal danger ... until this weekend, that is. 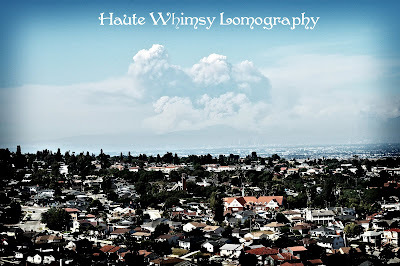 We had/are still having two wildfires rage through our state, and one was in my city of Palos Verdes. As wildfires go, PV had a best case scenario. Even though it ravaged 235 acres, we lost few homes and it has been completely contained. It was a very surreal experience as news stations urged us to gather our most precious belongings in case of a mandatory evacuation. The heat was unreal and our little PV world smelled like a Christmas-time fireplace. On Saturday afternoon I went for a drive and took photos of the evidence of the other Los Angeles wildfire that's still going strong. It's shamefully beautiful, as the smoke looks like a shimmery cloud from our vantage point. What I found so unbelievable was the size of the white smoke cloud, which is about 200 miles away! It goes to show just how much we under-estimate natural disasters sometimes. I agree, fires are scary. I've been evacuated when living in Ventura county, then moved to San Diego and we were surrounded with horrible fires/smoke a few years ago. Careful about breathing the smokey air, it affected me for months after the fires stopped. it's amazing how we all figure it can't happen to us.